A, C, E & L trains to 8th Avenue/14th Street. After a decade of success in the Meatpacking District, the Standard Grill enlisted acclaimed chef Rocco DiSpirito to re imagine the restaurant. The main dining room will serve a mix of indulgent and healthful options from a raw bar and new wood-fired grill. Currently open for dinner reservations Tuesday to Saturday. For breakfast, lunch and a casual daily dining, please visit our Grill Café page. Dinner was amazing ! Downtown Manhattan prices but well worth it! We are Italians, and we eated the best risotto in our life... Very well! The best meal of our stay in America. Our waiter, George, was brilliant from start to finish. Amazing in every way! The food was beautifully presented and equally as enjoyable. The staff was extremely knowledgeable of everything from the wine list to the main menu and were very attentive. The staff was very nice but trying way too hard in some ways and in others, not at all. Our conversation was interrupted every 3 min by another staffer asking the same questions asked by the staffer before. We dealt with 3 sommeliers, 3 manger types and two waiter types not including the multiple busboys. We asked to be talked to about an affordable wine so we could potentially order two bottles and was steered to one costing $95. Only after asking for something “ actually affordable” were we shown two bottles in the $50-$60 range. It would have also been helpful if the waiter had helped us consider and navigate our food choices more, and thought of the coursing. We let them know that we were sharing what we thought would be 4 courses and Instead got served as two courses- the main one feeling rushed and dumped on the table rather than orchestrated for optimum enjoyment. Three extremely rich dishes served all at once, negating the taste of each individually, including a short rib that was all congealed fat. When I enquired about the fattiness I was told that as the meat cooled it got that way. If this was something the kitchen knew, then why send it out with what should have been the risotto course? Or at least offer to heat it back up so it was edible. Overall, the quality of food was decent but the experience was lacking. Especially for the almost $400 for 3 people price tag! How great that Rocco is back. A fan since those great days on Lexington Ave. Place looks ok, tho the din is more than what OT calls energetic and it is very dark as well. Began with underwhelming Binchotan, which reeked from burnt sauce on grill. The same sauce made them taste too similar. Ordered the Porterhouse for two. In the darkness, seemed overcooked, but a very helpful Maitre d's flashlight showed it was cooked properly. Accompanying potato puree and kale were quite fine. We had the wonderful chocolate bombe for dessert. Only two cavils: expresso was room temp and the graciously provided replacement identical. We hardly put a dent in the delicious steak and asked to split it up to take home. Server brought only one bag but readily agreed to bring another. When we each got home, I had gotten her steak and she got none: rather a half onion. She was quite disappointed , as we had eaten less than half of the steak.but i suspect this won't keep us away. Our server, George, was the best! So nice, knowledgable, and professional. Will be back soon!! Amazing stake!!! Super delicious ribs!!! The staff is excellent! Love this place! Spectacular food-the Amuse-bouche of mussel and scallop and the short ribs were sensational.The ribs melted in our mouths-they were so soft.The waitress,who was the captain,was unbelievably helpful with our orders.Also,the prices were extremely reasonable.Its a definite return for us. I liked the vibe under the old chef better. Was a warmer/more welcoming feel. Despite great service, this felt less interesting. But the risotto killed it. Otherwise excellent. Food was perfect! The food and service were impeccable! Special note was the black truffle chicken and the pasta with the short rib sauce, OMG! My friends had the shared short ribs and raved about those as well. Thought I would miss the old menu but turns out change can be very good! Food was soo GOOD!! Really the best salmon I ever had! We loved everything!! Desserts were heavenly! 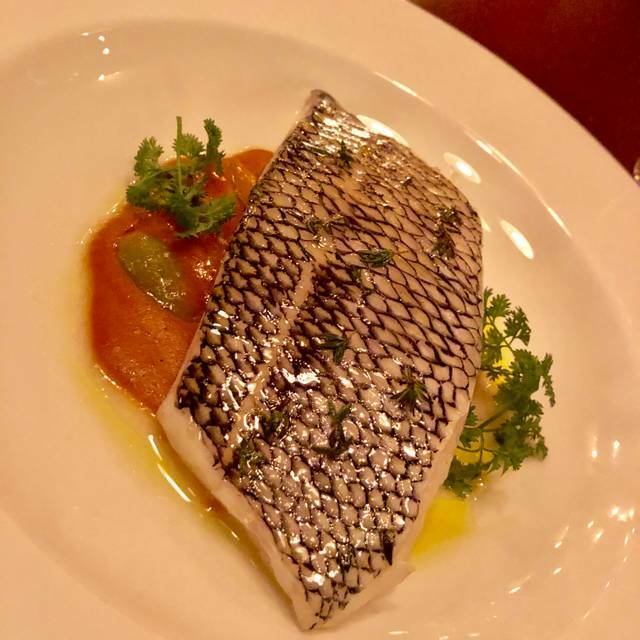 Having been lucky enough to have tried other creations from Rocco DiSpirito in the past, I was excited to try his latest venture at the Standard Grill. And let me say, he did not disappoint. From vibrant seafood to light and refreshing desserts, his talent for mixing new flavors and techniques into classic favorites shines in this menu. The ambiance is chic with a nostalgic aura and the service impeccable too. Go! 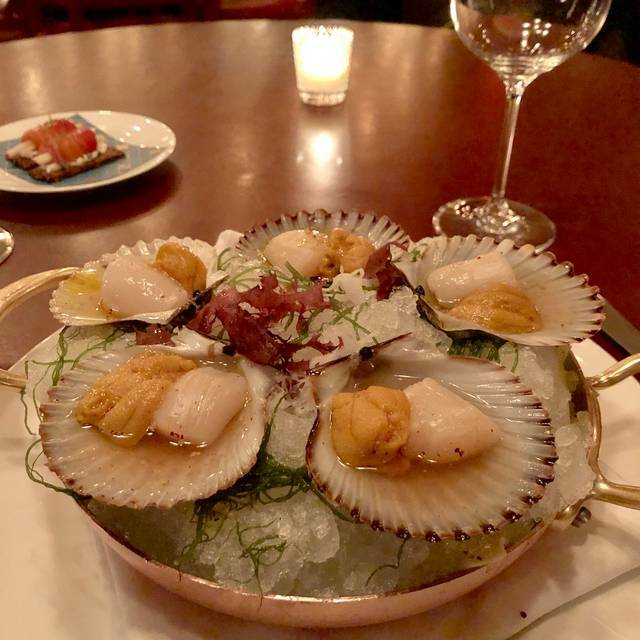 After reading Pete Wells' recent NYTimes review of the Standard Grill, I had to come in to try Rocco's raw scallops that Pete praises. And I have to say, they were absolutely delicious! There was also a surprisingly large selection of other fresh seafood that I enjoyed with my guest. Service was exceptional! I plan to come back soon with more colleagues. I love the food and the atmosphere, but this time service was very slow and the wait in-between courses too long. Also the waiter made strange recommendations having us choose two starters to share with scallops for instance... unfortunately this may make me chose another restaurant next time. This was my 2nd time since it reopened with Rocco. I enjoyed my first time better. The staff is fantastic and very knowledgeable. I loved a pasta dish so much the first time that I re-ordered it. It was not as good the second time so that was a little disappointing. Still all in all a delicious meal. The service and food were impeccable! The atmosphere is gorgeous and the attention to detail superb! The only negative is that there's a slight seafood smell in the dining room. The Standard Grill room has a real buzz about it. It is noisy, almost too noisy. Our starters of skewers of quail, Chicken livers and shrimp grilled over Japanese wood, were outstanding, our mains of Seafood risotto and spatchcocked chicken were just as good. The wine list is New York prices, absurdly expensive to a European, but it is extensive, and contains some gems. One thing, though. I would recommend anyone who has any back trouble not to sit on the banquettes. They are very soft and unsupportive, and they are low. Request a chair at booking. The quality of the food is certainly excellent. Perhaps the only slight downside of our visit was that there are a lot of staff at the restaurant and it was far from full thus service was on the border of over-attentive. The whole experience was very good and I would go back. Perhaps later in the evening if it fills up, then the staff will be more fully occupied. That is not to say they were not very courteous and helpful. The menu had some very interesting 'twists' which we enjoyed very much and are well worth trying. Warm inviting atmosphere albeit a bit overstaffed which is slightly distracting from your dining experience. The food and wine list were well above average . We shall return! We are fans of Rocco.. innovative and creative food preparation. Had an excellent server George.. It was the worst meal that I had had in a restaurant in years. I ordered a boneless ribeye rare. It was so thin that it was impossible to actually cook it rare. It was so salty that it burned my lips. I don’t think a dog would have eaten it. as before. Please be aware of eating at the “standard grill”. It’s completely not worth it. We've dined at the Standard Grill many times. It has always been great. If you can get a reservation grab it immediately. This restaurant has gone next level with Rocco Dispirito taking over. Excellent raw bar, amazing steaks and sides, and delicious beautiful desserts to cap it off. Trying way too hard with the new menu. The Standard Grill used to be reliably good but the concept since renovation really misses the mark. Salmon was undercooked and spare ribs left a bad smokey aftertaste. Service is still amazing and the staff tries hard to overcome the menu. Amazing food and amazing service. Will definitely return. I brought five guests and they will all be returning. Thanks for the amazing hospitality. Great meal, excellent flavors. Happily suprised at how many menu options (including the nut/seed bread!) are low-carb diet compatible. 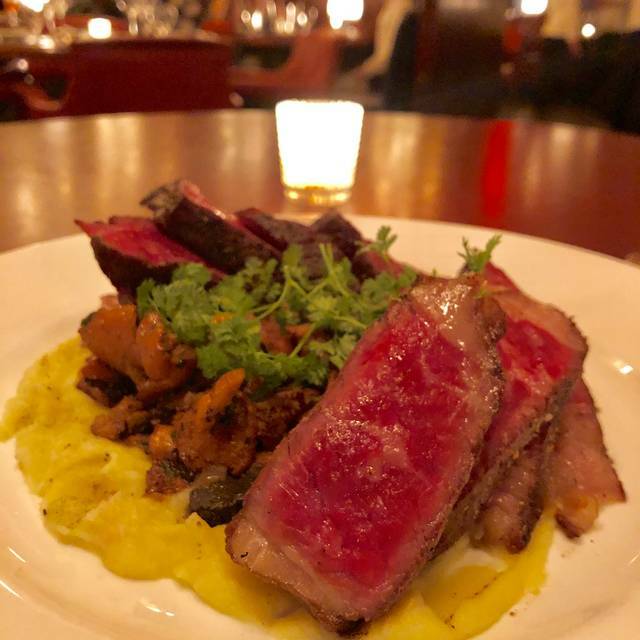 Excellent authentic NYC steakhouse. Food was delicious and service was excellent. Love that the menu is mostly gluten and dairy free. Food is a bit oddly constructed, but nice flavors and highly customizable. Overall, a pleasant upscale dining experience. The main course (ribs) and dessert were disappointing. Everything else was excellent, so we hope the main course can improve. 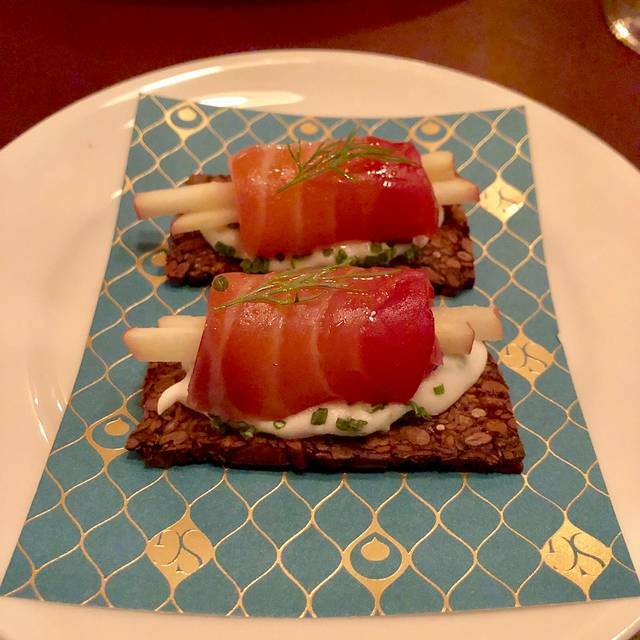 Everything at Standard Grill exceeded our expectation! The service was impeccable and our dinner and dessert were spectacular! Great to see Rocco DiSpirito cooking again and the entire experience did not disappoint! Will definitely be back again. We shared about 6 different small plates and it was delicious. I particularly recommend the scallops with sea urchin, the tuna tartare and the quail. I have been to the new Standard Grill several times in the last couple weeks and it just keeps getting better! My friends and I enjoyed the fresh seafood and yummy aged steak. Service was superb and the chef accommodated every request. Thank you! The new and improved Standard Grill is nothing short of spectacular. They are firing on all cylinders. Food, service, ambience and decor are next level. 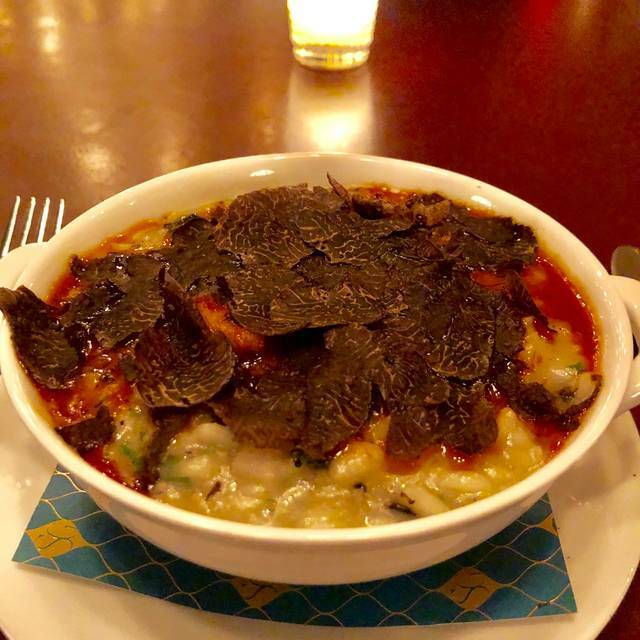 Some of the must try dishes are, truffle risotto, Peconic bay scallops and short ribs of beef! Make surrey say hello to the chef Rocco, and maitre d'hotel Michael, they are killing it. Chef Rocco Dispirito has reinvented the whole place since taking over the restaurant. The menu was inventive and the food spectacular. What was once a place I went to out of convenience is now a go to destination for me. Our meal was absolute perfection.